Real-time metrics reports show real-time or near-real-time metrics information about activity in your contact centre. Historical metrics reports include data about past, completed activity and performance in your contact centre. Contact Trace Record reports are detailed views of individual calls that you can review by searching for particular sets of calls. What if we have more requirements? The built-in reporting provides this information, however, it was not in a graphical format that made it easy for the client to see key contact centre metrics. There are currently 3 options for extracting near real-time data from Amazon Connect for access by other applications. We can use the recently added method to the Connect API called getCurrentMetricData, – you can use this API to query a limited amount of data within the Connect instance directly. You can then use that data in your real-time application, for example as a lambda function called from your connect call flow, or a web page displaying real time data. The other option, and the one we decided to use in this case, is to push/pull the connect data into AWS ElasticSearch and use Kibana to visualise the data in the way the client had requested. Thirdly, Amazon Connect pushes data more slowly into AWS Cloudwatch, but the update time on this data can be up to 5 minutes, so did not meet our clients requirements. Amazon Connect can publish contact centre events (including agent events), to a Kinesis stream. Agents Events are single log entries written when an agent changes state. As an example, if Jimmy was to transition from a Status Code of “Lunch” into “Available”, Amazon Connect generates an event for that change, and it can make that information available by putting it on the Kinesis stream. The stream can then be watched by services like elasticsearch, lambda and EC2, which can be alerted when a relevant event is made available. This process enables you to only monitor for the things your dashboard is interested in and enables you to create dashboards in external systems. Every connect instance has the ability to ‘stream’ these events although by default this is not enabled. Enabling this is trivial within the AWS Console for Connect. Once you enable the feature, AWS will walk you through creating a Kinesis Stream. Kinesis allows a Producer (Connect in this instance) to put data in the stream, we can then have multiple Consumers (Our Lambda in this instance) collect that data and do whatever we need with it. Once you enable this feature, AWS will walk you through creating a Kinesis Stream. Kinesis allows a “Producer” (Connect in this instance) to put data events in the stream. We can then have multiple “Consumers” (In our example this will be a lambda function) collect that data and do whatever they need with it. * The AWS credentials are picked up from the environment. * They belong to the IAM role assigned to the Lambda function. 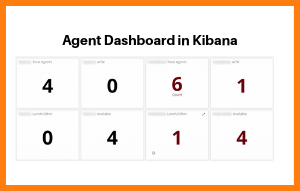 With the Lambda function above filtering for only the agent statistics that we are interested in, it is simply a matter of using the Kibana visualisation tools to display the agent statistics in an easy to understand format. And to complete the picture for you, here is the architecture that was used. As you can see there are many ways in which you can get important data to the people that need it, within the tools that they are used to. With Connect having the ability to be queried by API and Stream Agent Events your choices are vast One of the great benefits is that you can test and learn with no-regret decisions. Want to have another consumer of the Kinesis data? no problem! Sometimes the problem is knowing what you want and what’s possible – which is where we can help you. We can support you with Design, Implementation, Support and a mixture of the three. Contact Us to find out more.